ABA’s Veteran Oak Quarter scheme at the North West Cambridge Development was published in the Architects’ Journal, after the scheme was awarded with planning permission. “Alison Brooks Architects and Pollard Thomas Edwards have been given the green light for 240-homes as part of the North West Cambridge development. “The scheme is the first private housing within the University of Cambridge’s huge £1 billion masterplan which is being designed and delivered by, among others, Stanton Williams, Mecanoo, Mole and Witherford Watson Mann. “The latest plans include apartments, townhouses, and detached family homes. “The new homes will feature ‘front hallways, generous ceiling heights, large living areas and spaces for home working’. “The schemes form part of the massive 140 hectare project which includes 3,000 homes, 100,000m² of research space, a local centre and community facilities including a primary school, nursery, doctors’ surgery, supermarket and retail units. 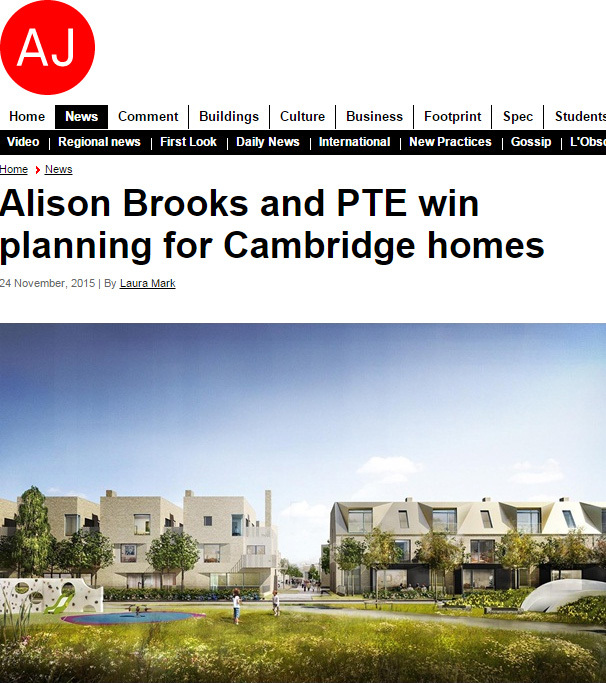 “Andy Hill, chief executive of Hill, said: ‘We are really pleased that the North West Cambridge site is moving forward – this new phase offers great family homes and pioneering design, which is exactly what Cambridge needs as it continues to grow in the years ahead. Providing more new homes will help to ensure that local families and those who work in our growing science sector are able to live close to the centre of Cambridge.